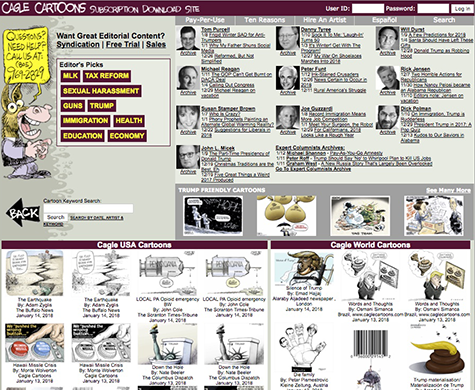 Political cartoons provide the perfect accompaniment to your editorial content whether it's in print or online. Our vast library of cartoons makes us the number one choice. Our unique editorial content engages readers, drives up interactions, helps retain subscribers & can build audiences. No other syndicate offers the features we do. Have you ever noticed those sneaky little price increases you get from the big cartoon syndicates? You will not get that from us! We even have special reduced rates for schools and non-profit organizations.